Halfway through the League1 Ontario season, the Aurora FC men’s side is hitting its stride. The club picked up its second win of the 2018 season on Sunday evening, a 3 – 2 victory over North Mississauga SC, as part of a 2-1-1 streak dating back to mid-June. Riding an abrasive offense that sent seven shots on the Mississauga goal, Maximillian Ferrari led the way for the Aurora side with a brace, his first two-goal performance in suiting up for ten games this season. North Miss earned the first real chance of the game in the twelfth minute, forcing Aurora keeper Ryan Collins to make a diving stop. Aurora returned less than a minute later with an offensive zone interception by Parmpreet Johal, sending Ferrari in alone on the keeper and putting it away on the far side. Collins was finally beaten by the Panthers on their fourth shot of the game in the 61st minute, fooled by a rebound he stood little chance on, though Aurora stormed back with their second of the game thanks to a substitution for Matthew McGrouther. Just two minutes after coming into the game, McGrouther finished off a well-place header to give Aurora the lead in the 77th minute. With momentum on their side, Ferrari potted his second of the game just seconds later to take an insurmountable late lead. North Miss brought the score back to within one with eight minutes to go, but a tactical change to a shutdown defense from Aurora eliminated any chance of a comeback. Picking up five of their nine total points on the season over the last four games, Aurora has settled into the middle of the pack in the League1 men’s side with six games left on the schedule, holding onto a record of 2-5-3. 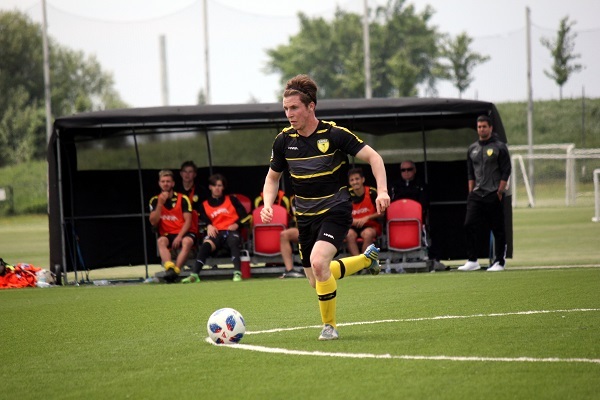 A tough matchup awaits Aurora on Aug. 8 when they host Toronto’s Sigma FC at Stewart Burnett Park, the only remaining undefeated team in the semi-pro league. Also visiting with North Miss on Saturday, the Aurora women failed to pick up a point in a 1 – 0 loss, shut out for the third game in a row. It was Aurora that dictated the pace throughout much of the first half, with Madison Johnson gaining the first real opportunity fifteen minutes in, though a ball on the goal line was cleared by a North Miss defender. In the 27th minute, a shot from Andrea Garcia just wide of the post was returned to the Aurora end, where Quinn Josiah was beaten from within the box for the game’s only goal. Aurora had one final chance in extra time of the second half, though a Natalia Casiello header sailed just wide to signal the referee’s whistle. They will be looking to keep a distance from Whitby’s Darby FC when they visit on Aug. 7, whose similar 1-7-1 record falls short of Aurora’s thanks to goal differential.